This kit services the neutral lockout lever and pulley washers on 1989 (CE) and newer 40 thru 125 rope Evinrude® and Johnson® outboard models. Remove rewind starter assembly from motor. Remove the lockout lever screw (A). Discard the lower lockout lever (B) and the two small washers (C). Coat the shoulder screw shaft with Triple-Guard® grease. Place the thin washer (2) on the screw. Place the upper lockout lever (D) on the screw. Place the two springs (E) on the screw. Place the new lower lockout lever (1) on the screw. Place the thick washer (3) on the screw. Install the shoulder screw and components into the starter housing. Tighten the shoulder screw securely. Position spring ends as shown. 40 thru 65 models - Install screw (8) and support (7) onto starter housing. The two ribs of support must face up and against the housing. Tighten screw securely. 125 model - Install two screws (8) and support (7) onto starter housing. The two ribs of support must face down and away from the housing. Tighten both screws securely. Remove the nut on top of the starter housing. Remove the washer and pawl plate screw. Remove the spring from center of pulley. Use a small screwdriver to remove the pulley retaining ring. Discard retaining ring. Remove the flat washer and the wave washer from the pulley. Discard the flat washer only. Hold the pulley in the starter housing while turning the starter over. legs down. Hold fingers clear of the pulley and jar the starter housing down against a bench to dislodge the rewind spring and pulley. 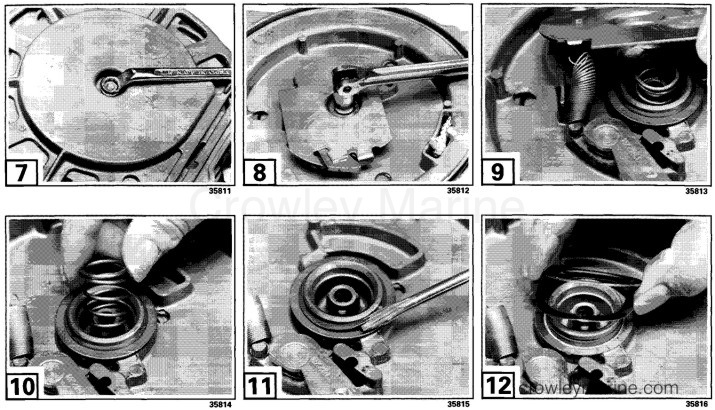 Remove the pulley bushing (A) from starter housing and discard. 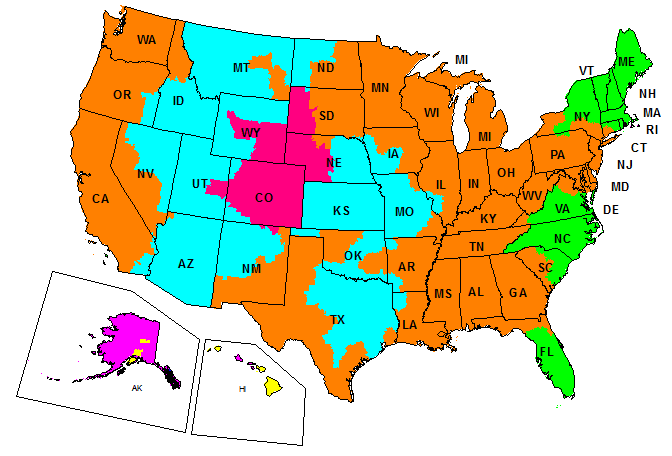 Follow Service Manual for cleaning and inspection of the starter parts. Lubricate bushing (6) with Triple-Guard grease and install bushing on starter post. 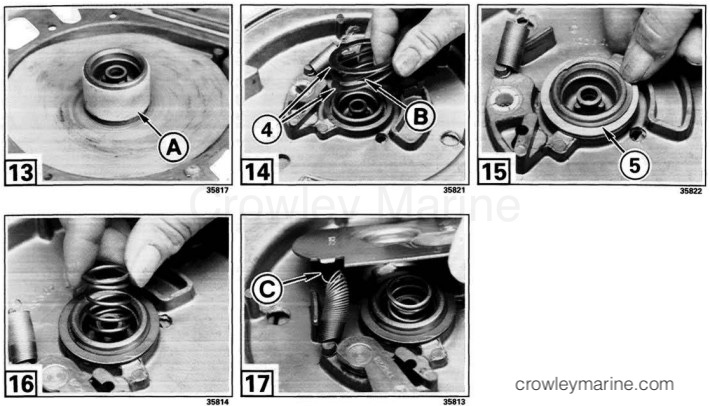 Follow service manual procedure to install rewind spring and pulley. Place one flat washer (4), then the wave washer (B), then the second flat washer (4) on the pulley. Install pulley retaining ring (5). Install the center spring in the pulley. Install the pawl plate. Hook spring on plate tang (C) and position pawl plate in starter. Clean threads of the starter pawl plate retaining screw and nut to remove adhesive. Install the retaining screw and washer into the starter housing. Tighten screw to a torque of 120-144 in. lbs. (14-16 Nm). Spray threads that protrude through the starter housing and threads of the nut with Locquic Primer and let dry. Apply Screw Lock™ to the threads of the nut. Install and tighten the nut to a torque of 120-144 in. lbs. (14-16 Nm). Check the operation of the starter pawl. The pawl should extend when the rope is pulled, and retract when it rewinds. Reinstall the starter handle bracket and the starter assembly on the motor. Follow the instructions outlined in the service manual. Adjust the starter lockout cable.